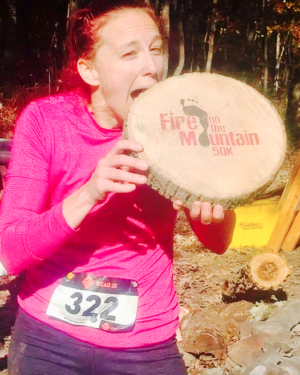 JENNINGS-RANDOLPH LAKE, W.Va. — Naomi Boddy had little room for error on Saturday as she sought to win her second consecutive Conquer the Dam 5K race at Jennings-Randolph Lake. Too bad for the competition, Boddy didn’t slip — not even a half a stride. The 39-year-old New Creek harrier outdistanced Krystal Stair by 32.7 seconds for the win. Boddy finished in 25 minutes and 26.2 seconds — slower than last year’s winning time (23:12.8) but still ahead of the rest of the women’s field. Stair finished second in 25:58.9 while Sarah Boddy, 19, of New Creek, took third in 26:07.8. The top three men finished within 12.4 seconds of each other. David Redman, 28, of Keyser, earned the overall win in 22:25.5. Steven Lowery, 19, of Ellerslie, Md., was a very close second in 22:26.3 and Jesse Wilson, 17, of Keyser, finished third in 22:37.9.